For other uses, see Drawing (disambiguation). Drawing is a form of visual art in which a person uses various drawing instruments to mark paper or another two-dimensional medium. Instruments include graphite pencils, pen and ink, inked brushes, wax color pencils, crayons, charcoal, chalk, pastels, various kinds of erasers, markers, styluses, various metals (such as silverpoint) and electronic drawing. In addition to its more artistic forms, drawing is frequently used in commercial illustration, animation, architecture, engineering and technical drawing. A quick, freehand drawing, usually not intended as a finished work, is sometimes called a sketch. An artist who practices or works in technical drawing may be called a drafter, draftsman or a draughtsman. Drawing is one of the major forms of expression within the visual arts. It is generally concerned with the marking of lines and areas of tone onto paper/other material, where the accurate representation of the visual world is expressed upon a plane surface. 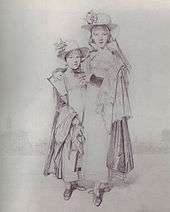 Traditional drawings were monochrome, or at least had little colour, while modern colored-pencil drawings may approach or cross a boundary between drawing and painting. 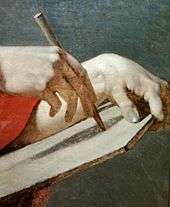 In Western terminology, drawing is distinct from painting, even though similar media often are employed in both tasks. Dry media, normally associated with drawing, such as chalk, may be used in pastel paintings. Drawing may be done with a liquid medium, applied with brushes or pens. Similar supports likewise can serve both: painting generally involves the application of liquid paint onto prepared canvas or panels, but sometimes an underdrawing is drawn first on that same support. Galileo Galilei. Phases of the Moon. 1616. There are several categories of drawing, including figure drawing, cartooning, doodling, free hand and shading. There are also many drawing methods, such as line drawing, stippling, shading, the surrealist method of entopic graphomania (in which dots are made at the sites of impurities in a blank sheet of paper, and lines are then made between the dots), and tracing (drawing on a translucent paper, such as tracing paper, around the outline of preexisting shapes that show through the paper). Drawing Outside the Arts Although the use of drawing is extensive in the arts, its practice is not confined purely to this field. Before the widespread availability of paper, 12th century monks in European monasteries used intricate drawings to prepare illustrated, illuminated manuscripts on vellum and parchment. Drawing has also been used extensively in the field of science, as a method of discovery, understanding and explanation. 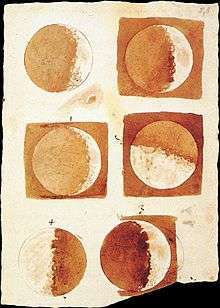 In 1616, astronomer Galileo Galilei explained the changing phases of the moon through his observational telescopic drawings. Additionally, in 1924, geophysicist Alfred Wegener used illustrations to visually demonstrate the origin of the continents. Drawing became significant as an art form around 1500, as artists like Albrecht Dürer came to the fore; in the early 15th century, engravings began to be made into prints and later came to be used as book illustrations. Measuring the dimensions of a subject while blocking in the drawing is an important step in producing a realistic rendition of the subject. Tools such as a compass can be used to measure the angles of different sides. These angles can be reproduced on the drawing surface and then rechecked to make sure they are accurate. Another form of measurement is to compare the relative sizes of different parts of the subject with each other. A finger placed at a point along the drawing implement can be used to compare that dimension with other parts of the image. A ruler can be used both as a straightedge and a device to compute proportions. When attempting to draw a complicated shape such as a human figure, it is helpful at first to represent the form with a set of primitive volumes. Almost any form can be represented by some combination of the cube, sphere, cylinder, and cone. Once these basic volumes have been assembled into a likeness, then the drawing can be refined into a more accurate and polished form. The lines of the primitive volumes are removed and replaced by the final likeness. 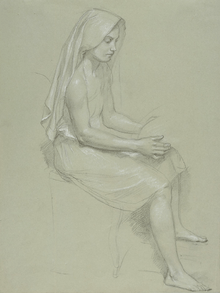 Drawing the underlying construction is a fundamental skill for representational art, and is taught in many books and schools. Its correct application resolves most uncertainties about smaller details, and makes the final image look consistent. Linear perspective is a method of portraying objects on a flat surface so that the dimensions shrink with distance. Each set of parallel, straight edges of any object, whether a building or a table, follows lines that eventually converge at a vanishing point. Typically this convergence point is somewhere along the horizon, as buildings are built level with the flat surface. When multiple structures are aligned with each other, such as buildings along a street, the horizontal tops and bottoms of the structures typically converge at a vanishing point. When both the fronts and sides of a building are drawn, then the parallel lines forming a side converge at a second point along the horizon (which may be off the drawing paper.) This is a two-point perspective. Converging the vertical lines to a third point above or below the horizon then produces a three-point perspective. The composition of the image is an important element in producing an interesting work of artistic merit. The artist plans element placement in the art to communicate ideas and feelings with the viewer. The composition can determine the focus of the art, and result in a harmonious whole that is aesthetically appealing and stimulating. The illumination of the subject is also a key element in creating an artistic piece, and the interplay of light and shadow is a valuable method in the artist's toolbox. The placement of the light sources can make a considerable difference in the type of message that is being presented. Multiple light sources can wash out any wrinkles in a person's face, for instance, and give a more youthful appearance. In contrast, a single light source, such as harsh daylight, can serve to highlight any texture or interesting features. When drawing an object or figure, the skilled artist pays attention to both the area within the silhouette and what lies outside. The exterior is termed the negative space, and can be as important in the representation as the figure. Objects placed in the background of the figure should appear properly placed wherever they can be viewed. 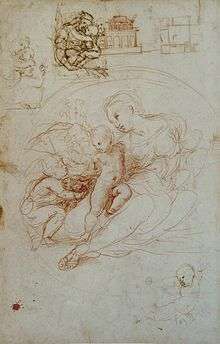 A study is a draft drawing that is made in preparation for a planned final image. Studies can be used to determine the appearances of specific parts of the completed image, or for experimenting with the best approach for accomplishing the end goal. However a well-crafted study can be a piece of art in its own right, and many hours of careful work can go into completing a study. Individuals display differences in their ability to produce visually accurate drawings. A visually accurate drawing is described as being "recognized as a particular object at a particular time and in a particular space, rendered with little addition of visual detail that can not be seen in the object represented or with little deletion of visual detail”. Investigative studies have aimed to explain the reasons why some individuals draw better than others. 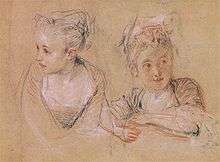 One study posited four key abilities in the drawing process: perception of objects being drawn, ability to make good representational decisions, motor skills required for mark-making and the drawer's own perception of their drawing. Following this hypothesis, several studies have sought to conclude which of these processes are most significant in affecting the accuracy of drawings. Motor function Motor function is an important physical component in the 'Production Phase' of the drawing process. It has been suggested that motor function plays a role in drawing ability, though its effects are not significant. Perception It has been suggested that an individual's ability to perceive an object they are drawing is the most important stage in the drawing process. This suggestion is supported by the discovery of a robust relationship between perception and drawing ability. This evidence acted as the basis of Betty Edwards' how-to drawing book, Drawing on the Right Side of the Brain. Edwards aimed to teach her readers how to draw, based on the development of the reader's perceptual abilities. Furthermore, the influential artist and art critic John Ruskin emphasised the importance of perception in the drawing process in his book The Elements of Drawing. 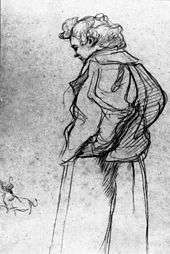 He stated that "For I am nearly convinced, that once we see keenly enough, there is very little difficult in drawing what we see". Visual memory has also been shown to influence one's ability to create visually accurate drawings. Short-term memory plays an important part in drawing as one’s gaze shifts between the object they are drawing and the drawing itself. ↑ www.sbctc.edu (adapted). "Module 6: Media for 2-D Art" (PDF). Saylor.org. Retrieved 2 April 2012. 1 2 Tversky, B (2011). "Visualizing thought". Topics in Cognitive Science. 3 (3): 499–535. doi:10.1111/j.1756-8765.2010.01113.x. ↑ Farthing, S (2011). "The Bigger Picture of Drawing" (PDF). ↑ Robinson, A (2009). Writing and script: a very short introduction. New York: Oxford University Press. ↑ Walker, J. F; Duff, L; Davies, J (2005). "Old Manuals and New Pencils". Drawing- The Process. Bristol: Intellect Books. ↑ See the discussion on erasable drawing boards and 'tafeletten' in van de Wetering, Ernst. Rembrandt: The Painter at Work. ↑ Burton, J. "Preface" (PDF). ↑ Chamberlain, R (2013). "Drawing Conclusions: An exploration of the cognitive and neuroscientific foundations of representational drawing.". ↑ Davis, P; Duff, L; Davies, J (2005). "Drawing a Blank". Drawing- The Process. Bristol: Intellect Books. pp. 15–25. ↑ Simmons, S (2011). "Philosophical Dimension of Drawing Instruction" (PDF). ↑ Poe, E. A. (1840). The Daguerreotype. Classic Essays on Photography. New Haven, CN: Leete's Island Books. pp. 37–38. 1 2 3 Kovats, T (2005). The Drawing Book. London: Black Dog Publishing. ↑ Duff, L; Davies, J (2005). Drawing- The Process. Bristol: Intellect Books. ↑ Mayer, Ralph. The Artist's Handbook of Materials and Techniques. Viking. ISBN 0-670-83701-6. ↑ Guptill, Arthur L. (1930). Drawing with Pen and Ink. New York: Reinhold Publishing Corporation. ↑ Hale, Robert Beverly (1964). Drawing Lessons from the Great Masters (45th Anniversary ed.). Watson-Guptill Publications (published 2009). ISBN 978-0-8230-1401-9. ↑ Watson, Ernest W. (1978). Course in Pencil Sketching: Four Books in One. New York, NY: Van Nostrand Reinhold Company. pp. 167–175. ISBN 0-442-29229-5. ↑ Ostrofsky, J (2011). "A Multi-Stage Attention Hypothesis of Drawing Ability" (PDF). 1 2 3 4 Cohen, D. J; Bennett, S. (1997). "Why can't most people draw what they see?". Journal of Experimental Psychology. 67 (6): 609–621. doi:10.1037/0096-1523.23.3.609. ↑ van Somers, P (1989). "A system for drawing and drawing-related neuropsychology.". Cognitive Neuropsychology. 6: 117–164. doi:10.1080/02643298908253416. ↑ Cohen, D. J.; Jones, H. E. (2008). "How shape constanct related to drawing accuracy". The Psychology of Aesthetics, Creativity and the Arts. 2 (1): 8–19. doi:10.1037/1931-3896.2.1.8. ↑ Edwards, B (1989). Drawing on the Right Side of the Brain. New York, NY: Putnam. ISBN 978-1585429202. ↑ Ruskin, John (1857). The Elements of Drawing. Mineola, NY: Dover Publishcations Inc.
↑ McManus, I. C.; Chamberlain, R. S.; Loo, P.-K.; Rankin, Q.; Riley, H.; Brunswick, N. (2010). "Art students who cannot draw: exploring the relations between drawing ability, visual memory, accuracy of copying, and dyslexia.". Psychology of Aesthetics, Creativity and the Arts. 4: 18–30. doi:10.1037/a0017335. Brommer, Gerald F. Exploring Drawing. Worcester, Massachusetts: Davis Publications. 1988. Bodley Gallery, New York, N.Y., Modern master drawings, 1971, OCLC 37498294. Frank Lohan, Pen & Ink Techniques, Contemporary Books, 1978, ISBN 0-8092-7438-8. Holcomb, M. (2009). Pen and Parchment : Drawing in the Middle Ages. New York: The Metropolitan Museum of Art. J. D. Hillberry, Drawing Realistic Textures in Pencil, North Light Books, 1999, ISBN 0-89134-868-9. Spears, Heather. The Creative Eye. London: Arcturus. 2007. ISBN 978-0-572-03315-6. World Book, Inc. The World Book Encyclopedia Volume 5, 1988, ISBN 0-7166-0089-7. Drawing/Thinking: Confronting an Electronic Age, edited by Marc Treib, 2008, ISBN, 0-415-77560-4. Wikimedia Commons has media related to Drawing. Look up drawing in Wiktionary, the free dictionary. Leonardo da Vinci: anatomical drawings from the Royal Library, Windsor Castle, exhibition catalog fully online as PDF from The Metropolitan Museum of Art (a great drawing resource). 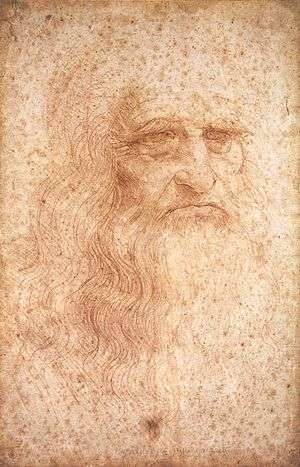 Leonardo da Vinci, Master Draftsman, exhibition catalog fully online as PDF from The Metropolitan Museum of Art (a great drawing resource). Drawing in the Middle Ages A good summary of how drawing was used as part of the artistic process in the Middle Ages.